Home Blog Ryan Hardy talks ABA Tour prep! With the first event of the ABA Tour start in less than a fortnight and the beginning of the APB World Tour just around the corner we took the time to talk competition preparation, tactics and analysis with our very own Coach Ryan Hardy. Ryan has over 25 years of global competition experience and won some of the most iconic and hard fought world tour events in bodyboarding history. If you have ever entered a contest or have an interest in competing then this is a must read! How much lead time do you give yourself in the run up to an important contest? Probably in the two weeks leading up to the contest I’ll make an effort to be in the water quite consistently like every second day. I’m generally always in an area where there are powerful waves (Margaret River or Bali) so I’m lucky that there’s always waves to surf and keep fit in so that’s what I use to prepare myself. 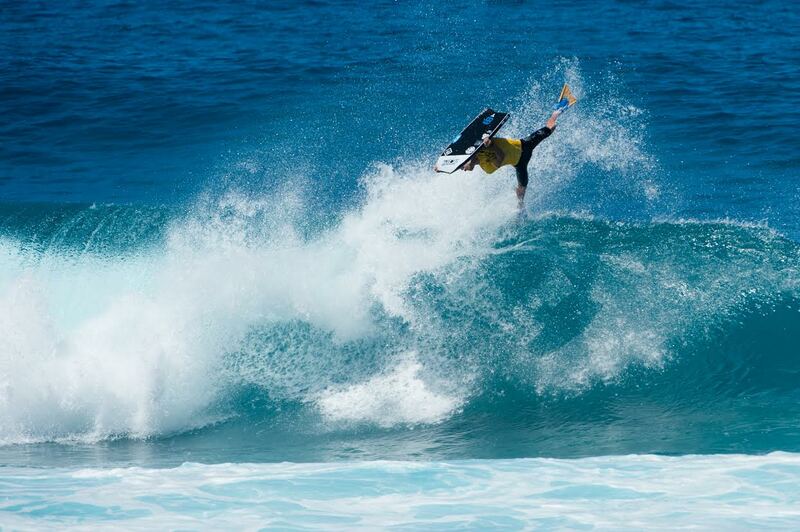 How do you adjust your free surfing in the lead up to a contest? The main thing I focus on is predicting what types of waves the contest will be on and practising in certain waves and attempting certain types of moves that will be scoring well in those waves. For example if it’s a peaky beach break I’ll try and surf mostly beach breaks beforehand doing moves both ways. It’s going to be a bowly left reef I’ll try and surf bowly left reefs and work on my left hand air moves like backflips and inverts. What is your pre-heat strategy? Definitely scope the conditions at least 2heats prior to my heat, keep in mind what the tide is doing to know if the heat will change at all during the 20-30minutes and pick a lineup spot where I think the highest scoring potential waves will be breaking. Do you like to make a plan? 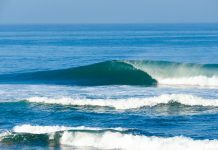 I like to ensure that I know where I think the best waves will be breaking offering the highest scoring potential and have an idea of what moves are scoring the highest to keep in mind when I will be catching my waves in the heat. How long do you give yourself before you change the plan? If set waves don’t come that I anticipated catching and I’m behind the other competitors by halfway through the heat then I’d probably look at changing my position and in most lineups, half a heat is still enough time to get two waves if you hunt around on the inside for smaller waves. How do you manage emotion in a heat? Stress emotions and panic can quite easily creep in during contests when you have time and other competitors bearing down on you creating pressure. The best thing I’ve found to do is to try and remain focused and calm, keep running over what it is you need to do in your head and even talk to yourself in your head to reassure yourself that that you’re on track. You have to ensure that you don’t get swept up in the panic of needing to get scores against a ticking clock and talented competitors that have high scores already posted against you. How do you make good decisions? Good decisions are almost always made before the heat has even started. Creating a strategy with where you will sit, which type of waves you’re aiming to catch and how you’re planning to surf them (without scripting your wave start to finish…it’s important to leave much of your performance to spontaneity because all waves break differently. It’s just good to know which scores are going to score the highest on particular waves eg. a big invert of a set wave). This will come down to being prepared with your riding coming into competition day and then studying the conditions and knowing the lineup and where the best waves will most likely be breaking when your heat is on. Do you think it’s beneficial to wear a watch? Why? I think it’s definitely beneficial to wear a watch! I know some people don’t like to because they don’t like the pressure but I think it’s really important, particularly as the heat is winding down. If you’re having a shocking heat you need to know if you have enough time still to catch two scoring waves or if you need one last wave in the last minute and there are sets coming you need to check the time and know if you have to catch the 1st wave of the set or the last wave of the set. Often heats come down to the very last minute and if you don’t know the exact time and can’t hear the announcer then your world of panic becomes a whole lot more out of control!! Be active or sit and wait? Both being active or sitting and waiting have their merits and both strategies can win heats depending on the luck on the day with the waves coming in. In general, an inconsistent day with high scoring potential on inside waves is a day to get active, whereas a consistent day with low scoring insider waves and the set waves are much higher scoring is more a day to sit and wait for sets. There are so many days where it is in between and you have to think about whether you can handle the pressure of sitting and waiting while your competitors get a lead on the inside and then you HAVE to get a bomb set or do you get busy on the inside with the risk that you’ll miss the best heats of the set and get smoked by the other competitors getting the highest scores on the bombs. Do you change your work rate/ plan based on the heat structure? (man on man, 3 man or 4 man heats). My heat plan would definitely change based on whether their is priority in play or not. A 4man heat with priority is much different to a 4man heat without priority. Whatever it is you have to best prepare yourself for the battle of being on the best waves that come in. If their is no priority you have to be ready to get in the hassle and use your best hassling skills to get on the inside when the best wave comes in without getting too deep or interfering on another competitor. Another factor would be if the time of the heat is shorter or longer…if it’s shorter like 15minutes I’d have a plan to wait less and catch more waves, if it’s 30minutes I’d definitely wait for the bigger sets. Overall the number of competitors in your heat shouldn’t change your plan too much, the rider that will win the heat will be ripping the best waves offering the highest scoring potential. The main objective is to get yourself on these waves. After the contest how do you analyse your performance for next time? – isolate bad decisions, weak points of your surfing? I think it’s really important to pinpoint what went wrong and to not blame other people eg. judges, other competitors, etc. There are so many improvements and adjustments to be made over a competitive career that there is almost always something to take away from a heat that you’ve been beaten in. It can get the opinion from a person that you trust, be it coach, parent, peers, team mates about why they thought you were beaten (and not judges bad scores!) that will definitely help. The most important thing is to note WHY you were beaten and HOW you could’ve won if you’d done things differently either with your performance on the wave or the waves you caught. It’s natural to be bummed and pissed off with yourself when you lose, but if you just walk away in a stink and don’t get that post heat analysis then it’s unlikely that your performance or your competition game will improve for next time. It’s also a good way of dealing with your loss is to analyse your defeat, work out where things went wrong, but still accept that you gave it 100% and believe that you will be more prepared for the next contest. Can you offer examples of where you have done this? Haha too many examples of losses because for almost all competitors, there are a lot more losses than wins which is how competitive people get so good in the first place because they are forever working on improving their game! One example I remember was during a national titles Open final when I was 19. I was in the final and the waves were fun 3-4ft beachy with good sections. I caught some of the best big sections of the heat but I was going a bit too hard and not making the air moves. I was going for big flips that I was only just starting to land during freesurfs and I didn’t land any and ended up getting 4th in the final. A peer later told me that if I’d just stuck to big clean inverts or even just big clean rolls then I most likely would have won that final. As much as that pissed me off to hear, it stayed with me to this day that sometimes an element of safety in competition should be practised to ensure that you’re maximising your score while minimising the risk. Competitively what is it that you think separates people like Player, King, Hardy, PLC, Moz, Tamega, Stewart and Hubbard from other exceptionally talented bodyboarders? Why are they so dominant? Well if I think of all those names and see common traits in personality and performance it would be this: all are extremely competitive and can’t stand losing! They are all very driven and every single one of them has put an incredible amount of time into improving their riding ability and improving their competition strategy so that come competition day they know they have a good chance of winning. Their riding is so advanced that they can achieve the highest scoring potential in any given conditions; big, small, reef, beachie and they are all very experienced competitors so they’ve learnt a lot of lessons over the years and sharpened their competition act so they know what to do in every situation. It’s very rare to see the wheels come off these competitors and they are very driven to win due to their competitive nature and that combination makes them very dangerous in competition! But it’s important to know that any competitor is beatable particularly in the ocean where the factor of luck comes in with the random nature of the waves. You just gotta bring your best game when the opportunity arises! Ryan runs coaching weeks with us here in Bali where you can improve on all aspects of you riding in fun waves and have an awesome time whilst you are doing it! If you are 18 or under and wish to become a professional bodyboarder then the best thing you can do is apply for our Ryan Hardy Super Grom Camps. Ryan will work on all aspects of your riding, plus competition strategy and everything else that you will need to know to kick start you career. You will also have all the sessions photographed by a professional photographer and a videographer! Contact us for details of all our packages! Next articleWe speak to Mez, the man behind NMD and VS bodyboards!